Flyball is a dog sport in which teams of dogs race against each other from a start/finish line, over a line of hurdles, to a box that releases a tennis ball to be caught when the dog presses the spring loaded pad, then back to their handlers while carrying the ball. The dog sits on a box releasing a tennis ball.Flyball started as a dog sport in the late 1960's and early 1970's, in Southern California. Some dog trainers combined scent hurdle racing with the dogs bringing back tennis ball to the finish line. 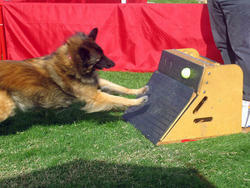 Then a tennis ball-launching apparatus was added and the first flyball box was born. Herbert Wagner is credited with making the first real flyball box, and he also demonstrated flyball on the Tonight Show with Johnny Carson. Flyball has now expanded into many countries including Australia, Canada and South Africa, and in Europe countries such as Belgium, Britain, Czech Republic, Finland, Germany, the Netherlands and Poland have National flyball tournaments and also hold joint annual European championships. The European championships were held in Britain in 2007 the Czech Republic in 2008 and Belgium in 2009. A Border Collie jumps hurdles in a flyball demonstration.Flyball provides an entertaining and active way to interact with one's dog and other dog enthusiasts in an environment that is fun and allows the dogs exercise and enjoyment. It is an especially effective way to burn off the energy of dogs with a high drive to work, such as Border Collies and Terriers. A large part of flyball's popularity stems from the fact that it is one of the competition activities available to mixed-breed dogs, allowing rescued mutts and non pedigree dogs to shine alongside their purebred canine counterparts. Though herding dogs currently dominate the courses, many champion teams have mutts on them. Dogs earn titles and awards based on points earned by their team in racing. Flyball is not limited to the size of the breed, as smaller dogs such as Jack Russell Terriers and Whippets often compete with great success in mixed-breed teams (teams consisting of dogs of various sizes and breeds). Smaller dogs are often prized as the hurdle height is based on the height of the smallest dog in the team, commonly known as a "height dog". Their only limitation is whether they can trigger the release pad, and small dogs often have to fully jump on it to do so. A young dog takes part in a flyball training session, note the use of netting to stop the dog running out.Competitions are usually hosted by a specific local flyball club but under the sanction of a national governing body. The host club may be devoted solely to flyball or to many other types of dog sports. The host flyball club uses Head judges who are licensed by the national sanctioning organization and the club will apply to the national sanctioning organization for permission to hold a competition on a specific date or weekend; most competitions are two-day weekend events. Although competitions may vary, teams are normally seeded into divisions against other teams of similar speed. This allows the races to be closer and much more exciting. Each team in the division will usually race against all the other teams in a round robin format. The overall winner is the team with the most wins. In competitions all teams will also be trying to improve their own individual team's best race time. Teams that underestimate their speed may "break out" of their division in competition. The break-out time for a division is typically set at 1 second faster than the top seeded team in each division. The break-out rule is intended to encourage teams to seed themselves accurately, as any heats where a team breaks out do not count and are recorded as losses. 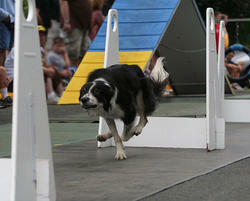 The largest single regularly held flyball competition is the North American Flyball Championships. In the 2009 Championships there were about 300 teams competing.